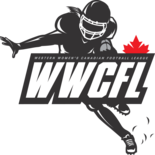 Women Play Football and Women’s Football Talk team up to give teams a Coaches Choice Offense/Defense Player of the Game award t-shirt for teams in the WFA and the IWFL. At the end of the game the Head Coach Home/Away team will choose one offensive player of the game and one defensive player of the game to be awarded a Real Women Tackle t-shirt. For every game that Nancy and I attend, or game that is being broadcast over-the-air through Women’s Football Talk, the Home/Away teams Head Coach will choose one Offensive player and one Defensive player to receive the Real Women Tackle t-shirt. T-shirts (4) will be awarded on-the-spot for games in attendance and shipped to the Head Coach for those games being broadcast. Not to discount any teams that the crew don’t attend or broadcast, we are offering a weekly drawing Every Sunday during the regular season on Women’s Football Talk radio show for Offense/Defense players for their chance to win (2 t-shirts awarded per week). The Head Coach (subject for verification, please include phone number) would need to submit names to contact@wfbtalk.com. Be sure to put Coaches Choice in the subject line. Note: For traveling teams, a management member may contact us with the Head Coach Choice, but be sure to include information for verification. ALL entries must be received by 12:00pm(pst)/3:00pm(est) Sunday. Winners of the weekly drawing will be read on Sunday’s show. Players, be sure you let your coaches know about this weekly award. *All t-shirts will be shipped to Coaches to ensure proper sizing. ** Deadline to submit for weekly drawing is Friday 6pm(pst)/9pm(est) before the following weeks game and will be read on-air Sunday’s show.